Jose is one of the three senior operators stationed in the network control center. He has the evening shift. His job is observe the system as it operates, react to unexpected incidents and judge network performance. He was on staff when the system went live over 6 years ago. Over time he was promoted to senior shift operator partly because he was good at identifying operational decisions made by the system that needed to be adjusted to match operational realities. These “rules” form the foundation of the control between the evolving system’s intelligence and operational realities. The operations center that Jose oversees looks like the typical control center with banks of huge interactive monitors. 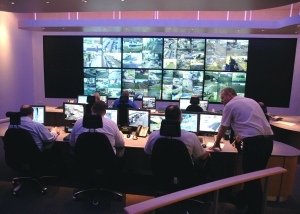 There are multiple computer operational screens for the entire network. Some show the location of each carrier within the network while others show traffic volume and system buffer space. There is a screens for each hub showing carrier positions, buffer limitations and passenger traffic. The real time operating conditions for all of the mechanical and electrical equipment in the hub are displayed with appropriate warnings. In general, Juan does not make many operational decisions each day other than to respond to the usual man caused emergencies that happen every day.It wasn’t always the same. The first few months were hell. Like all new APMs, the software was refined but had only simulated data to base decisions. Even though the system was tested with software that simulated the operation all considerable modes and traffic flow there were many surprises when the system went live. The software had to be given certain “rules” when it acted inappropriately for the specific circumstance. Over time the combination of growing amount of historical records and site specific rules created a very stable mass transportation system. Juan was proud that he was part of the team that generated the rules that crafted the system to the realities of operational needs. Most of the screens in the control center are live video feeds from around the network. Full time recording cameras are on all levels of the hubs including machinery areas. The video images will be kept in long term storage and can be recalled if ever needed. Juan and the other operators constantly monitor all screens to try to see anything that may need their attention. The operators often can see unusually high congestion in a hub waiting room or on the loading platform. Of greater importance is often the detection of potential mechanical problem before it happens. Most of the problems occur at a local hub. The issues can be medical, criminal, operational or mechanical. Since security personnel are always stationed at the hubs, most issues are quickly resolved without interfering with the APM operation. The APM network works best when it is operating below the design capacity. Even at design capacity, there is always enough buffer space within the hub to allow for a long loading without affecting the traffic in the hub. Extended stops have the potential of affecting the speed of the ropeways that are entering the hub. Under some conditions, the ropeway will have to be slowed or stopped if there is not enough room in the hub to accept incoming carriers. By the nature of network design, traffic can be diverted around any hub that has an extended blockage. The APM operated as expected during the commuter phase of Juan’s shift. There were no problems except for two apparent heart attacks, a birth and four domestic dispute. The fight in the cabin between spouse is common and quickly resolved when the carrier arrives at the next hub to waiting security. After the evening rush was over and traffic volume decreases, the APM begins to create empty cabin around the network. These carriers are moved to one of the carrier parking structures that are located around the network. Carriers are parked in these multilevel structures when not needed and put in the parking structure that is close to the next scheduled demand cycle. By feeding empty carriers into the network on those ropeways approaching high demand areas, the capacity for the hub can be temporarily increased. In the evening, Juan notices the typical migration of empty carrier to the Blue hub, for the expected morning commute. At midnight, Juan finishes his shift. The night operators has already arrived and been briefed about the last 8 hours of operations. The night operators has a different role than the day operators. At night is when freight carriers replace many of the passenger carriers. Juan is ready to go home and get some sleep. It has been a good day.